Robots make the difference. Autonomous vehicles helps medical equipment repair center to reduce its space requirements for repair cell rooms by 40%. GE, at its 280,000 square foot healthcare equipment Repair Center in Milwaukee, WI, uses a large number of self-driving robotic vehicles from OTTO™ motors. OTTO Motors is a sister concern of Clearpath Robotics Inc. The autonomous OTTO vehicles greatly contribute to making GE Healthcare’s lean manufacturing policy work effectively, enhancing speed of equipment repair for hospitals and medical centers. GE Healthcare offers various state of the art transformational medical equipment and technologies that are taking healthcare to a new level. When found defective, a medical device needs to be repaired quickly so that the device can be put back to use for the patients who rely on that. If the device is not repaired efficiently and quickly, the healthcare procedure can be lengthy. Patricio Espinosa, the director of Americas Repair Operations at GE Healthcare, points out the importance of having an on-demand solution for transporting medical equipment throughout the facility. As OTTO vehicles take medical equipment to the destination points, the vehicles are perfectly serving the purpose at GE’s healthcare repair operations center. Patricio Espinosa praises the performance of OTTO self-driving vehicles because the vehicles can accommodate the changes in the routes as well. The incorporation of the OTTO self-driving vehicles has allowed GE to reduce the size of its healthcare equipment repair cell rooms by 40 percent. Medical equipment parts are quickly delivered. They smoothly navigate from pick-up point to the specified destination. Additionally, the OTTO vehicles are able to take on several duties at a time within the plant area. GE uses the same vehicle for transporting parts from one place to another and also to move finished goods to its shipping areas. In fact, the multi-functionality of OTTO vehicles has enabled GE facility to increase its productivity of floor use by 66 percent. Joe Germait, a Manufacturing Technician at GE Healthcare facility, says that OTTO vehicles have made the job easier for them. As the OTTO vehicles quickly pick and move materials, the workers can easily switch to the next part. 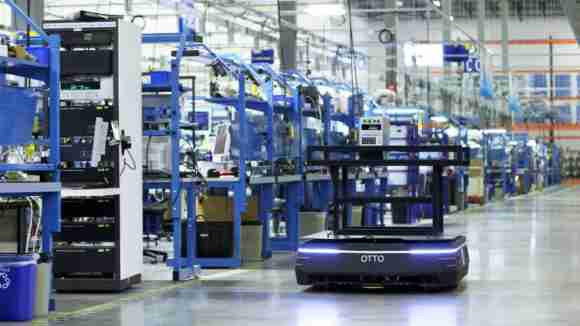 Workers often meet OTTO self-driving vehicles in the aisle ways and they perfect goes right around the workers. Previously, technicians had to put the medical equipment parts into a cart and move that manually into shipping zones and repair cells. Productivity was not good as equipment transport was highly dependent on manual tasks. As fixed infrastructure and carts used to occupy spaces, the healthcare facilities needed more space. As GE Healthcare’s top priority is to offer best patient care, the OTTO vehicles are adding great value in attaining that goal. Simon Drexler, the Director of Products at OTTO Motors, mentions how important a role OTTO vehicles are playing in GE’s Milwaukee repair center. The use of artificial intelligence and advanced sensors in OTTO vehicles allow them to have the flexibility of human decision making. In addition, the efficiency of a conveyor and the reliability of an AGV make the vehicles highly effective. No fixed infrastructure such as pre-defined laser paths, magnetic tape and beacons are required for OTTO motors. The OTTO 100 and OTTO 1500 are the two main OTTO vehicles available right now and both can move at more than 4 miles/hour carrying various types of attachments. As the vehicles have obstacle recognition and avoidance power, they efficiently move across the facilities and transport parts in destination points in quick time. The vehicles are capable of running 24/7 as they autonomously visit their charger for rapid, frequent charges between missions.